Greenlight Capital founder David Einhorn — who has been vocal about his Tesla short — piles on criticism in a recent investor letter. “The wheels are falling off — literally,” Einhorn says in an investor letter seen by CNBC. "The wheels are falling off — literally," Einhorn, founder and president of Greenlight Capital, said in an investor letter seen by CNBC. 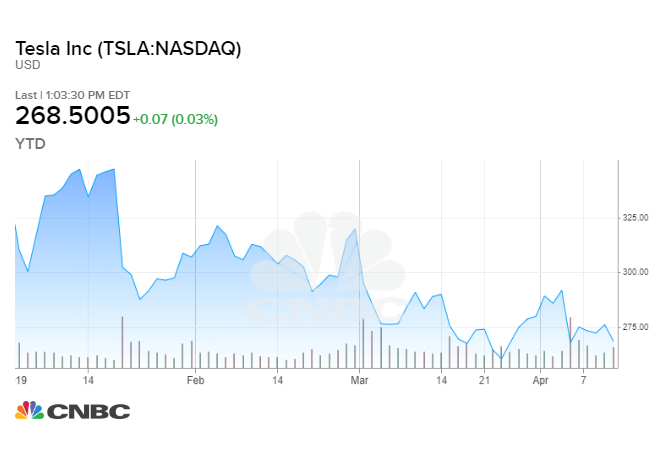 Einhorn's public bet against Tesla added to the fund's 11 percent gain in the first quarter. The 50-year-old investor slammed Tesla's safety protocols and cars with faulty suspensions, "such that the wheels sometimes fall off (referred to as 'whompy wheels')." He cited an incident in February when a man in Florida was killed in his Model S after hitting a tree. "TSLA routinely touts its cars as the safest around, because they perform well in crash tests. The truth is, its overall safety is much lower because of events like this," he said, adding that the fatality rate for Tesla drivers is much higher than it is for other luxury cars. Among Einhorn's other reasons to bet against Tesla: Lack of demand, "desperate price-cutting," closing-and-then-not-closing stores, closing service centers, cutting capex, layoffs, "rushed product announcements," and a "new effort to distract investors from the demand problem with hyperbole over Tesla's autonomous driving capabilities." Einhorn also took on Tesla CEO Elon Musk, who he said, "never admits the crisis in real time." "The company appears to again be on the brink," he said. "The signs are everywhere." Last year, the Tesla short was a drag on the fund's performance. Greenlight had its worst year on record while Tesla rallied roughly 7 percent. This year though, Tesla shares are on a different trajectory. The stock is down roughly 20 percent since the start of 2019. Einhorn said Tesla was "notably absent" from a consortium of automakers to establish safety rules for development, testing and deployment of autonomous vehicles. The automaker "continues to use its customers and other motorists, bikers, and pedestrians sharing the road with distracted or sleeping Tesla drivers as guinea pigs," he said. — CNBC's Leslie Picker contributed reporting.